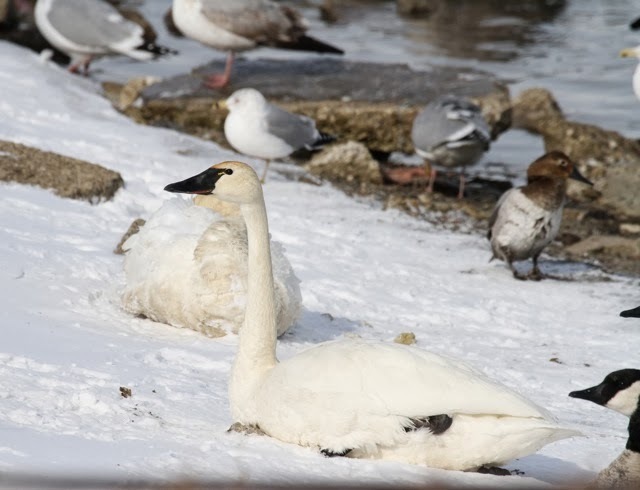 Julie Zickefoose on Blogspot: Duck Duck Goose... Swan! 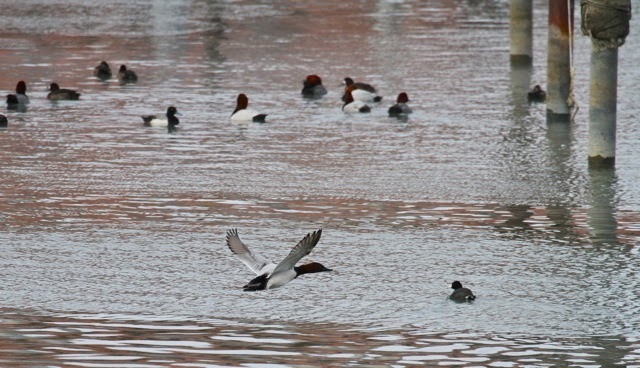 Diving ducks are such fun to watch, the way they suddenly arc and disappear, then pop up like corks yards away. Odd as it seems, they bathe all the time. They seem to enjoy it. But they also need to bathe. 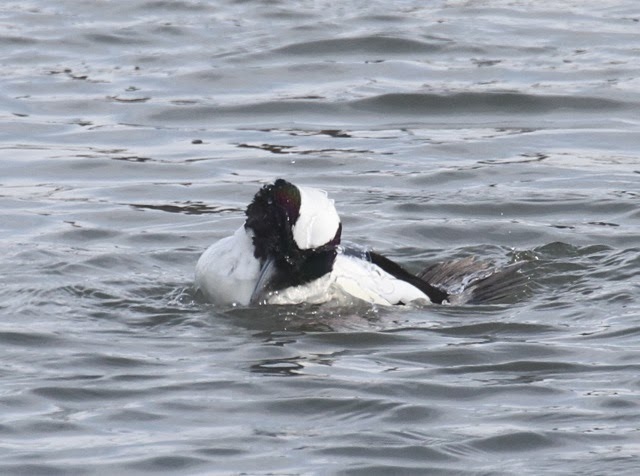 A little drake bufflehead dunks his face as two greater scaup preen and dabble. 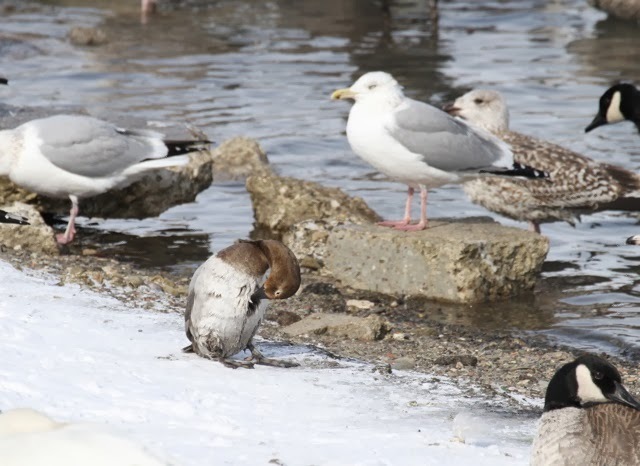 He shuffles and lets the water into his feathers, then squeezes it out. 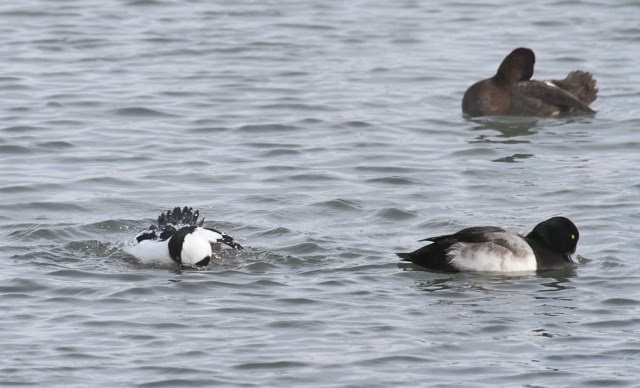 I call buffleheads "Sea Chickadees." Only the ruddy could possibly give them competition in the Cutest Duck pageant. He seems to enjoy his bath (here his head is completely inverted as he squeezes the water out of his breast feathers). 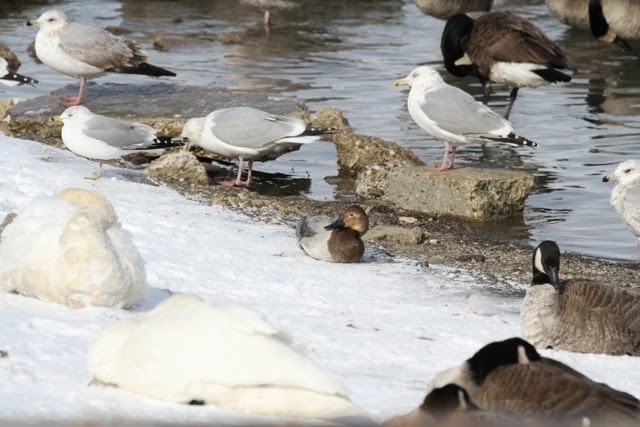 But he also has to bathe, has to keep his feathers spotless and grease-free, for they are all that are between him and the single-digit cold, cold so stark it takes my breath away in seconds when I leave the car. It's seven degrees and he's bathing. A hen canvasback preens those all-important belly feathers. I'm so delighted to see this little tank out of water that I don't even notice the large cream-colored lump in the lower left of the frame. just like on the tundra...swan!! Oh hello! Your cryptic coloration was working fine! I'm delighted to see its red smile line, as well as its little yellow loral spot. File under: what I love about birdwatching. 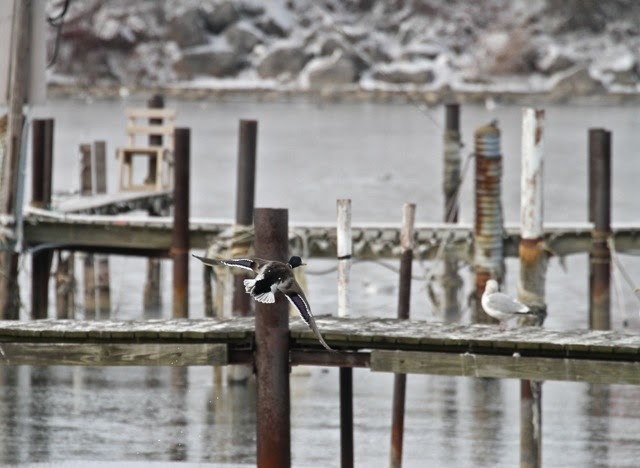 Birding in a place like Dunkirk Harbor is just one surprise after another. It's like opening one of those stacking Russian dolls. I've little doubt I missed a lot of what was there, for there was so much there, but I surely enjoyed what I did see. Here's the drake canvasback, his ruby eye glowing improbably in a burnt sienna face. Not sure who thought up that color scheme, but it's a fetching one. What a glorious duck, all swooping curves. 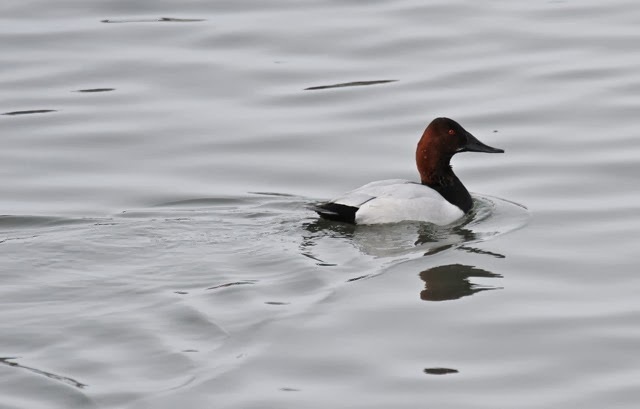 Canvasback because he's as white as canvas. Which no one hardly uses any more, except in sails and better tote bags. The old names are so evocative, but we rarely think of why we use them. Will we have nylonbacks in the future? The terra-cotta containers reflect on the water, making a lovely painting as another drake takes off. It's such fun to shoot these ducks flying against pier, rock, smokestack, container. Compositionally, I'd have placed the heavy pier to the left, but oh well. A mallard leaves. Look! 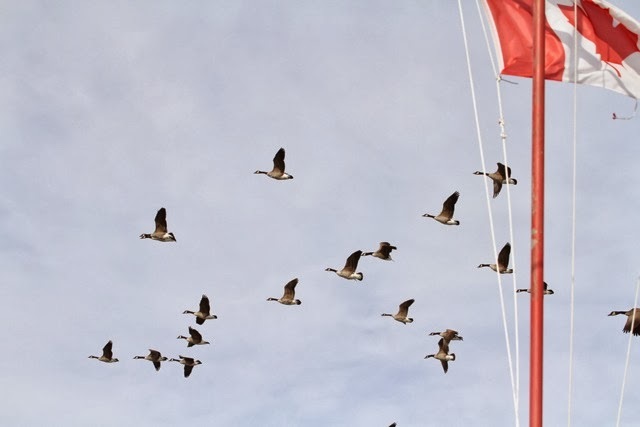 Canadian geese! Lots of them there. That, and seagulls. Yes. I am messing with you birders. Do you favor experience or study to learn about birds? 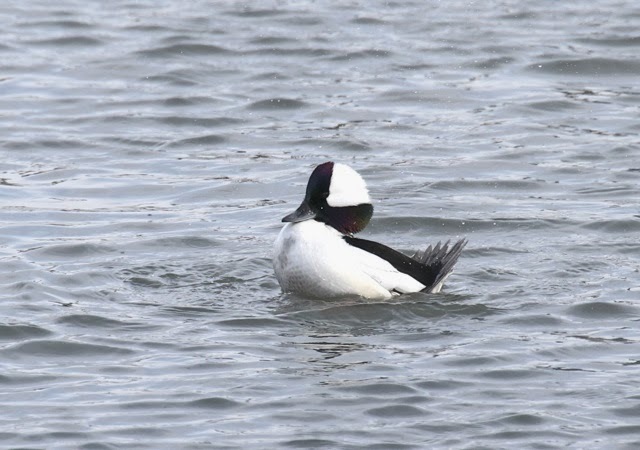 I've always liked the old name "Butterball" for Bufflehead. Not sure if it refers to the amount of fat they have or their shape. Not sure what you're asking Kelly Crawford, but if you have a chance to spend time in the field with living birds, there's no substitute for that. Walter, another thing that has vanished from birding vernacular: names that reference how birds taste,or look when skinned (hence Doughbird for the superfat migrating Eskimo curlews).